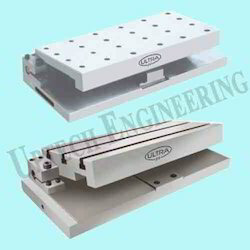 We are counted amongst the foremost exporters of superior quality Ultra Brand Sine Tables. These Sine Table require minimum maintenance and are resistant to abrasion and corrosion. 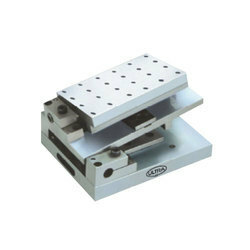 These sin tables are provided with meticulously designed our Steel Tray Square is used for checking the Squareness and straightness of the line on the plain. The blade can be set at any position. We fabricate these sin tables using quality measures and exported with four different combinations. These plates have a sharp, square-edged hole bored in a flat thin plate with or without bevel at the outlet depending on size & usage. This tool has blackened steel blade's that are set right angle with brass rivets. We are the leading manufacturer exporter of Sine Table. Angle can be set within ±5 seconds. This Compound Sine-Table have a great demand in the market. It is very useful for inspection or machining of simple and compound angles. 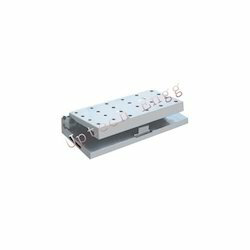 It can be supplied with vice pre-mounted. 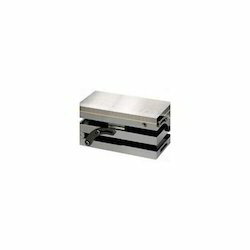 This compound slide table is equipped with additional accessories such as calibrated wheels and a handle to rotate. These are easy to operate and provided with maintenance free services. These are stringently checked for quality before delivering to the clients. We are the leading manufacturer exporter of Magnetic Sine Tables. This Compound Sine-Table is manufactured using qualitative alloy steel and have a great demand in the market. 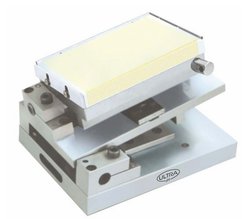 It is very useful for inspection or machining of simple and compound angles. It can be supplied with vice pre-mounted. This compound slide table is equipped with additional accessories such as calibrated wheels and a handle to rotate. These are easy to operate and provided with maintenance free services. These are stringently checked for quality before delivering to the clients.